Schmetz® Embroidery needles have an exclusive scarf, needle back and wide eye, these needles help in protecting delicate threads. 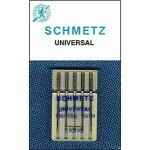 They also allow for easier embroidery by eliminating some spooling friction. You can use these embroidery needles with polyester, rayon and specialized embroidery threads. 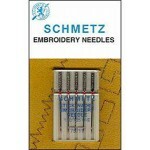 Designed for rayon and polyester embroidery applications but useful beyond the design limits!